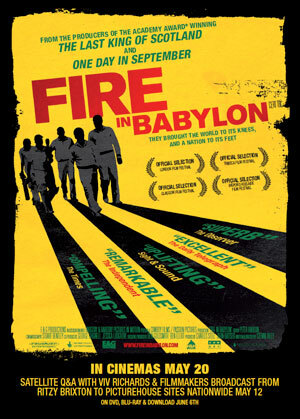 I (Martin) finally got to see Fire in Babylon, the 2010 documentary on the evolution and triumph of the great West Indies sides that dominated world cricket from 1980 to 1995. The documentary affirms what Evander and I wrote about in our book Right Off the Bat: that cricket in the West Indies always meant more than economic opportunity or the enjoyment of the game. It was also a statement about racial equality and a chance for those who’d been belittled and humiliated to get back at those who for so long had demeaned them—their former colonial masters. We’re reminded that the Windies’ strategy of blasting out the opposition with a seemingly endless supply of fast bowlers—Michael Holding, Andy Roberts, Colin Croft, Wayne Daniel, Joel Garner, Malcolm Marshall, and so on—was itself a reaction to the dominance of Australia’s two quicks, Jeff Thomson and Dennis Lillee in the mid-1970s. We’re also made aware that the Windies were criticized for their brand of fiercely competitive cricket; most sides were used to Caribbean sides playing stylish and joyful cricket—and losing. How dare they show up trying to win! Those who have no interest in, or understanding of, cricket will still be able to appreciate the documentary. They’ll see how the rise of Black Power in the U.S. influenced people in the Caribbean not only to take on the oppressive forces that still lingered from the colonial area, but to take on the corrupt political ruling bodies in the Caribbean itself. The result, as Fire in Babylon shows, was that cricket became one of the major forms of cultural self-expression and confidence, as important as Bob Marley and reggae in the Caribbean and ska/two-tone music in the U.K. It was a renaissance of confidence that brought change not only in the Caribbean, but it raised the consciousness of the U.K. Highly recommended. This entry was posted in Australia, Cricket, West Indies and tagged Andy Roberts, Bob Marley, Colin Croft, Dennis Lillee, Jeff Thomson, Joel Garner, Malcolm Marshall, Michael Clarke, Wayne Daniel. Bookmark the permalink. Reblogged this on Scunners Cricket Club.